Joris Teepe Quintet CD Release - "In the Spirit of Rashied Ali"
The great guitarist Kenny Burrell wrote, “Freddie Bryant is a brilliant young guitarist and composer.” He is a versatile musician skilled both in jazz and classical music. Freddie is currently in demand in the New York jazz scene where he works with Ben Riley’s Monk Legacy Septet (“Memories of T” on Concord Records), The Ben Riley Quartet (new CD release – March, ’12), the Mingus Orchestra and his own group, KALEIDOSCOPE whose CD was released in Oct. ’12 on the HiPNOTIC record label. His new CD, Monk Restrung, celebrates the music Thelonious Monk and features his guitar/bass/drums trio as well as duets with Peter Bernstein, Howard Alden and Romero Lubambo. He has seven other CDs as a leader: Dreamscape: Solo, Duo, Trio featuring Chris Potter and Scott Colley (GJKSounds), Live Grooves…Epic Tales with his band Kaleidoscope including Donny McCaslin and Yosvany Terry (HiPNOTIC records), Brazilian Rosewood, Boogaloo Brasileiro, Live at Smoke with Steve Wilson, Chris Cheek, Diego Urcola, Edward Simon, Edsel Gomez, Avishai Cohen and Jordi Rossy (Fresh Sound Records); and Take Your Dance into Battle with Don Braden, Ira Coleman and Billy Drummond (Jazz City Spirit) as well as Trio del Sol (Twinz Records) with MishaPiatigorsky and Gilad. Freddie has also had the honor of touring with three legends of the music world: African singer, Salif Keita, the virtuoso klezmer clarinetist, Maestro Giora Feidman and the jazz trumpet great, Tom Harrell (as a member of his quintet, 1999-2001). He has recorded and/or played with Tom Harrell, D.D. Jackson, Steve Wilson, Kevin Hays, Brad Mehldau, Chris Potter, bassist Avishai Cohen, Rosanna Vitro, Dee Dee Bridgewater, Sheila Jordan, Randy Brecker, David Sanchez, Joshua Redman, Wynton Marsalis, Max Roach, Lonnie Smith and many others. He is also on the first call list of many singers and Brazilian musicians because of his sensitive accompanying and his knowledge of Brazilian guitar and has toured with pianist/singer Eliane Elias. This international experience has energized and inspired his music as is evident in the exciting CD with his Kaleidoscope group from 2012, Entitled Live Grooves…Epic Tales it features a powerful front line of Donny McCaslin (tenor) and Yosvany Terry (alto) with a grooving rhythm section of Patrice Blanchard (electric bass) and Willard Dyson (drums). It also features guest appearances by master saxophonist, Steve Wilson and Spanish pianist, Juan Galiardo. The music is a kaleidoscope of rhythms and influences including soulful Gospel, driving Indian/Middle Eastern, sensual Bolero and funky New Orleans rhythms in addition to Brazilian and Afro-Cuban rhythms. His previous CDs as a leader include:Brazilian Rosewood, Boogaloo Brasileiro, Live at Smoke (Fresh Sound Records) and Take Your Dance into Battle(Jazz City Spirit). He has two recent self-titled CDs with collaborative groups: Trio del Sol with Misha Piatogorsky and Gilad and Dharma Jazz with Lewis Porter, Badal Roy and Karttikeya. Education has always been a large part of his musical life. He has taught all ages from young children to university students and has lectured about jazz to audiences around the world. In 2004 he was chosen to be a Copeland Fellow at Amherst. 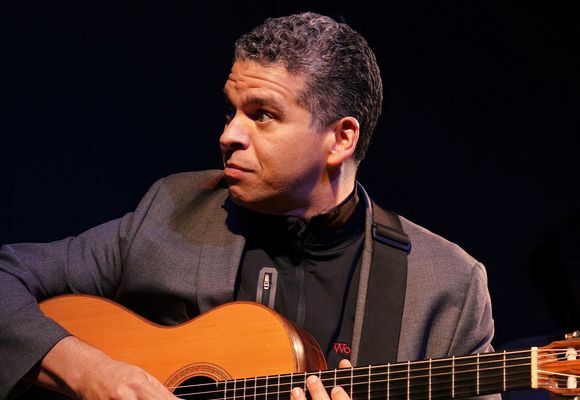 He received his BA from Amherst College ’87 and Master’s degree in classical guitar from the Yale School of Music. He currently is on the faculty at the Berklee College of Music and the Prins Claus Conservatory in Groningen, Holland. He was previously a professor in the Africana Studies and Music departments at Williams College.